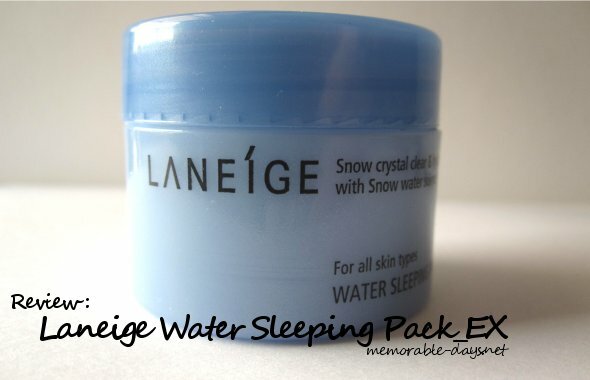 Review: Laneige Water Sleeping Pack_EX | Memorable Days : Beauty Blog - Korean Beauty, European, American Product Reviews. It's a sleeping mask that provides intensive hydration, vitality and brightening effect while restoring skin with deep relaxation while you're asleep. This product is suitable for all skin types. The sample size comes in a blue plastic jar and the normal size (80 ml) comes in a sturdy glass container with a screw top lid. Besides, it also has a small plastic spatula to scoop the product out. It's quite an expensive product. They are selling it for €18.60 at Sasa.com. The normal size contains 80 ml of product. This sample jar that I got contains 20 ml and this can be purchased at Yesstyle for €6.76. 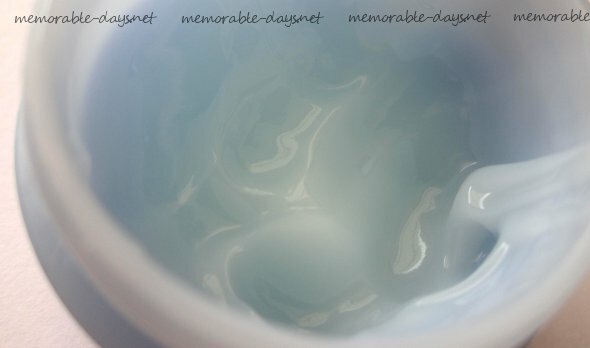 The product itself is a creamy light blue, almost white gel and it has a very pleasant and light fresh floral scent. Once applied onto skin, it feels like thick water but it's not runny in any way. It also has a cooling effect which is very relaxing when applied. When it is fully absorbed into the skin, it feels very smooth but you still retain that moistness that you typically feel when you wear a cream. Use 2 - 3 times per week after moisturizer and eye cream. Apply a walnut-sized amount evenly onto face, avoiding the eye and mouth area. No need to wash off after applying. Allow gel to absorb into the skin for about 15 minutes before going to bed. Wash your face the next morning and you will notice that your skin will be brighter and more hydrated. When I first applied this on my face I used way too much product than needed. I applied a thick layer at the first time. That took around 30 minutes to absorb into my skin. I didn't wait at first and just went to bed, which made my pillows all dirty >.<". Therefore, I wouldn't recommend to apply that much product, a walnut-sized amount is too much. The second time I used it, I applied a thin layer which took around 15 minutes to absorb. It did feel a little bit sticky but it didn't stain and I didn't have any breakouts after using this product. I have been using this product for longer than a month now. I highly recommend this product to people with dry to dehydrated skin ^__^. This product really feels good & relaxing!!! I especially love the cooling effect and you can even put this in the fridge for maximum coolness! Haha, that's great for the summer ^__^! It really does what it says, I noticed the brightening effect after using it a couple of times and my combination dry skin feels more hydrated than before :D. The only downside of the product is the price. Is it really worth the money (€18.60)? I would say yes. Just keep in mind that you won't need much product, the 80 ml jar will go a long way. I will definitely purchase the normal size when I'm done with the sample jar =D.